No 1 Ranking Wedding Fair Website in Google Search – http://www.klpj.com.my has now launched its phase 2. 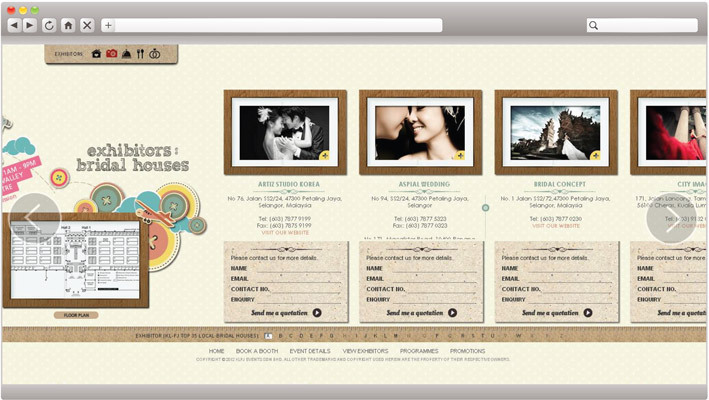 Wedding couples who are visiting the web can now experience the enhance version of its exhibitors’ content. KL-PJ Wedding Fair 2014, also known as Malaysia’s Most Prestigious Wedding Event – on 23-25 May 2014, will be held at Hall 1 & 2, Mid Valley Exhibition Centre, Kuala Lumpur. It features 35 Top Local Bridal Houses from KL & PJ (Kuala Lumpur & Petaling Jaya). The bridal fair will also be presenting more than 70 venues couples can find to hold their wedding dinner / wedding reception, from restaurants to hotels to club. An expectation of 30,000 visitors to KL-PJ Wedding Fair 2014 can browse through the website to see who is exhibiting (with brand name, address, contact details, galleries and their website), which is pretty common. Apart from that, visitors can now send direct enquiry to the exhibitors under each exhibitors profile. This will help the visitors to enquire or to discover more on the products or services offered even before and after the fair. Visitors can search for their favourite exhibitors under different categories – Bridal House, Hotels, Restaurants and Beautiful Brides (Wedding Services). Beautiful Brides (Wedding Services) – All under one roof, exhibitors include Malaysia’s best spas, beauty and slimming salon, wedding gowns and dresses, shoes, jewellery, wedding planner, live band, cake makers, stationers and more! KL-PJ Wedding Fair 2014 has everything you need to plan a truly unique wedding day and to make you the super-beautiful bride of the day!